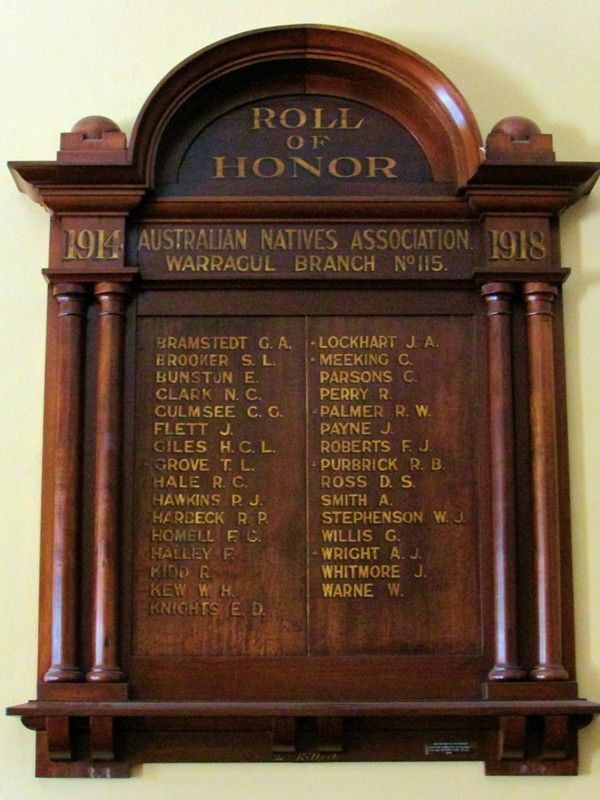 The Honour Roll commemorates members of the Warragul Branch of the Australian Natives Association (A.N.A. ) who served in World War One. The twenty-eighth anniversary of the Warragul branch of the Australian Natives' Association was celebrated in the Shire Hall on Wednesday evening. On previous occasions the event took the form of a smoke social, but this year, in order to give the mothers and other relatives of the boys an opportunity of witnessing the unveiling of the Honor Roll, it was decided that the 1919 function should consist of a social evening. There was a fairly representative gathering, including the Chief President of the Association, Mr. G. D. McLean, and the Shire President, Cr. H. E. McFarlane. A generous profusion of flags was used in the decorations, and interspersed with greenery, the effect being very pleasing. The "piece de resistance" of the evening was the unveiling of the Honor Board by the Chief President, who said, in one sense, it gave him great pleasure, but there was a certain amount of sorrow attached to the duty, as it contained the names of some who would not return. The war had proved to be the most terrible in the history of the world. He hoped the newly formed League of Nations would see to it that war never occurred again. One thousand one hundred A.N.A. members would not return; including the six who went from Warragul. As they would observe, there were 31 names on the Honor Board. It was a splendid record for the Warragul branch, and on behalf of the Board of Directors he congratulated them. When they enlisted they knew they had to fight, but did not shirk it. Many of them saw the wounded who had returned from Gallipoli; but that did not deter them. They deserved the highest positions this land could give them. The enemy had not been very far from the Sydney Heads, but the Australian boats had kept them away. He was pleased to comply with the duty of unveiling the Honor Roll. They would always honor the names inscribed thereon, and would revere them with the fondest recollections, "They are not dead. They still live with us!" exclaimed Mr. McLean. To the mothers, wives and sweethearts he tendered all praise, for they had given everything. They would never forget their deeds. Amidst applause, Mr. McLean said he was fortunate, he had only two sons, and both returned last week. The Honor Board is a very handsome piece of carving of polished blackwood. Excerpt from West Gippsland Gazette (Warragul, Vic), 28 October 1919.